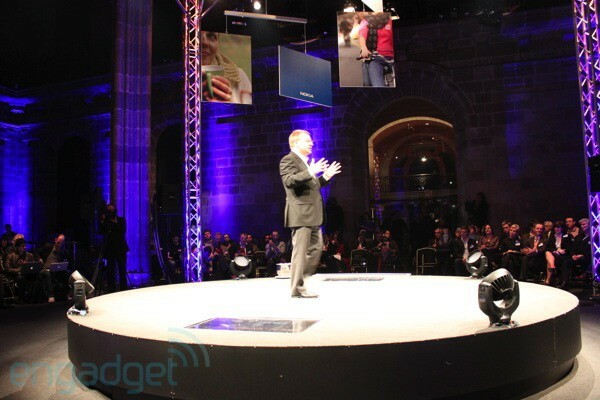 Live from 'An Evening With Nokia' at MWC 2011! We've been gathered at the same cozy venue as two years ago (for the introduction of the E52, if memory serves correctly) for Nokia's event at MWC 2011 this evening... and frankly, in light of what's happened the past few days, we're not quite sure what to expect. CEO Stephen Elop should be on stage to take some questions -- but in terms of product or strategy announcements, it's anyone's guess. Follow the break for all the fun! 7:26PM And that's it -- Elop's off the stage! We have to say, the guy was super respectful of the audience and of everyone that asked a question, saying "thanks for that question" with almost every one. 7:25PM He can't share financial details about Nokia's discussions with Google. Bummer! 7:24PM Some dude in the audience just yelled, "are you a trojan horse?" "I'll take that question. The obvious answer is no. We made sure that the entire management team was involved in the process, and of course the board of directors of Nokia are the only ones that can make this significant of a decision about Nokia. They made that final decision on Thursday night." 7:23PM Now we've got a question about the Microsoft shares that Elop allegedly holds. "About me being the 7th largest shareholder in Microsoft: that is not true. That would be a substantial amount of money that I don't have... when I moved from Microsoft from Nokia, I was legally prohibited from selling my shares. As soon as that lifted, I began selling. But when our discussions began, I had to stop selling again -- the laws are very clear. As soon as the legal restrictions lift, of course I'll sell those shares. I have been given an equity position in Nokia" but that won't be disclosed until later in the year for some financial and legal reasons. 7:17PM Oooh, a question about Friday's walkout! "The announcement around Windows Phone -- and the whole strategy that we laid out -- I would say was very broadly received well within Nokia. But it was kept very confidential for a variety of reasons. So what we're doing now is going through a journey with employees to help them understand why we made these decisions and what they mean. The way I would characterize this is that there are two journeys through which everyone needs to go. There's an intellectual journey; that's easier because you understand the logic. But what also began for many employees on Friday was the emotional journey -- what does this mean? How does this effect my job? They look at this and say, boy, this could be bad... Stephen said on stage that there will be significant reductions in headcount. This creates uncertainty. We're trying to handle this as best we can. But there are some very positive signs within our employee base, for example in our sales department. In markets like the United States -- both sales and development -- are excited because they see the way back into that market. But at the same time, there are people in our engineering and development departments that are hurting right now. There's a great deal of pain and a great deal of excitement. Thank you for that question." Whew! 7:13PM "Part of what I want to do at Nokia is make sure that when we announce a date, we're absolutely sure about that date." He's also saying -- and this is something we've heard before from VP Savander -- that he's trying to reduce the time between announcement and launch. 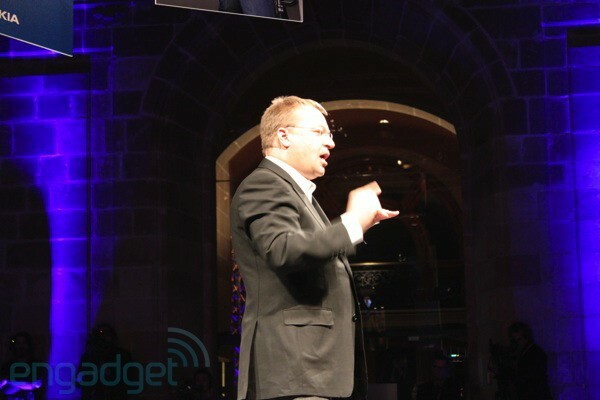 7:11PM Elop says that it makes sense for a "single infrastructure" to exist for selling apps, which would be why the Nokia content environment will live within the Windows Phone Marketplace. He says that Nokia's contributing its strong carrier billing relationships around the world to that. 7:09PM Jo and Stephen are both making it clear that we won't see any new hardware today (in case it wasn't obvious). 7:07PM "Do you not feel threatened at all by BlackBerry?" Elop: "We believe that with the work we've done already with our lower-priced devices, combined with the business capabilities of Microsoft, we have a very strong competitive position relative to everyone in the environment." 7:06PM Elop won't talk euro values for how much it's dumping into MeeGo, but "as you think about it strategically, we have to place a significant investment in the next disruption." He keeps putting "MeeGo" and "disruption" in the same sentence, but in its multi-year history, neither Maemo nor MeeGo have disrupted anything so far. Not a thing. 7:04PM Elop: "It has been discussed that Nokia plus Microsoft together have an extraordinarily strong intellectual property portfolio." He specifically says that he doesn't want that comment interpreted or extrapolated... so yeah, don't go thinking that these two companies are about to get married, alright? 7:02PM "It has been the case that within Nokia, our development environments have been somewhat scattered within four areas." 7:01PM Though Microsoft is the primary supplier of dev tools for Windows Phone, Elop says that Nokia will be making a significant investment in providing its own value-add to that developer environment. 6:59PM "That being said, as we achieve our first priority of beating Android, we'll be competing within the Windows Phone ecosystem, and that's fair." 6:59PM Question is whether Nokia would prefer to be the sole supplier of Windows Phone devices. 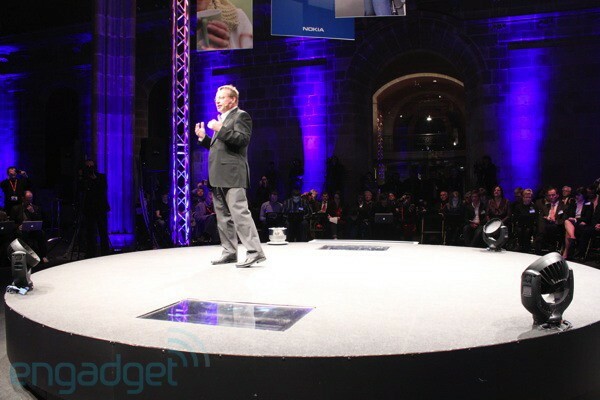 Elop: "Great question. What's best for Nokia is an environment with multiple competitors creating an ecosystem." Pretty straightforward -- he doesn't want to be the only maker of Windows Phone 7 devices. 6:58PM "We have fresh new products [on the low end] that we're introducing into the Indian market that have features like dual-SIM." 6:57PM "The question is, what do we introduce into the Symbian environment to ease the transition to Windows Phone. So that's part of the mission that we're taking on now." 6:56PM Q&A time. Harlow and Elop are both on stage. 6:56PM "We'll spin around in circles on stage as we take questions." Now this we'd like to see! 6:55PM "The question is, how do you feel about the existing team members? The answer is that I have absolute confidence. I've seen their contribution. So I've respected that. But the context in which our team members are operating has changed." 6:54PM "It is the case that as I entered Nokia, and worked literally every single day with the senior leaders of Nokia, I had to go through this assessment." 6:52PM "We have been in consulation with Intel -- including immediately after we made our final decision to go Windows Phone -- as that just happened on Thursday night of last week." 6:52PM "It is the case, as we've said, that we'd ship our first MeeGo device this year, then shift our attention to the next generation of disruption. 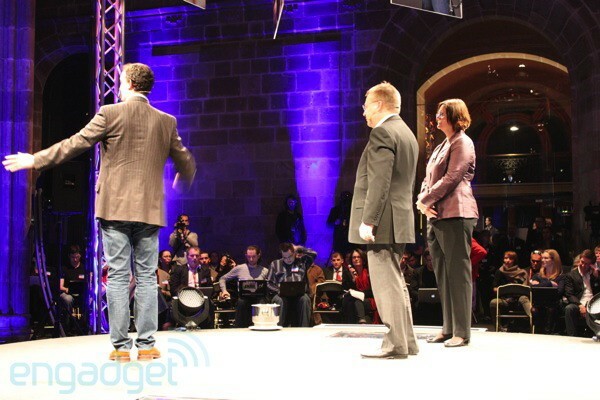 MeeGo will be part of our consideration and exploration as we go forward." 6:51PM Now he's talking the future of MeeGo. 6:51PM "At the same time, there's been a lot of speculation in the blogosphere about whether Qt will be part of our 'next billion' strategy. We have not made any decisions." 6:51PM "The first MeeGo device that will ship this year will take advantage of the Qt framework. Question is, will Nokia put Qt on Windows Phone? Our initial response is no, that's not the plan. The reason is that if we encourage a fork in Windows Phone's development platform, we could create a situation where we confuse developers and consumers." 6:49PM Elop's back on stage. 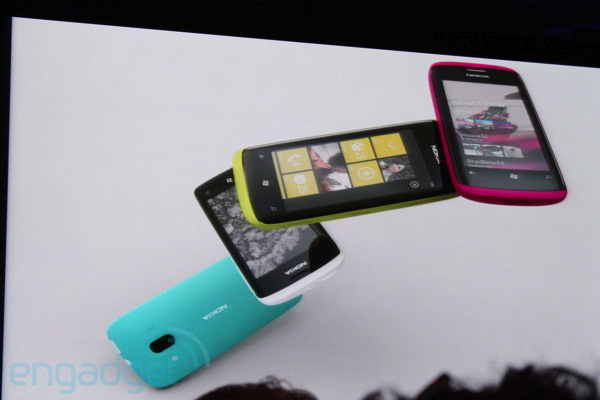 6:49PM "We will be able to ship volumes of Symbian devices in the coming months and years. We'll be able to carefully manage the transition from Symbian to Windows Phone." 6:48PM Jo's saying we'll see "significant improvements" both in hardware and software for upcoming Symbian products. 6:48PM "We will be making significant short-term investments in the Symbian platform so that our partners can see the value that that platform offers." 6:47PM They just flashed our leaked device on the screen! 6:46PM Strong suggestion there that we'll see WP7 gear from Nokia this year. Interesting. 6:46PM "My boss has told me he would be much happier if that time was in 2011." 6:46PM "We are the partner who will bring innovation in design and hardware to make great mobile products with Windows Phone -- and we've already started. We've had teams working together in interesting places such as Reykjavik, for example, and they're meeting to decide the timing of the first Windows Phone product." 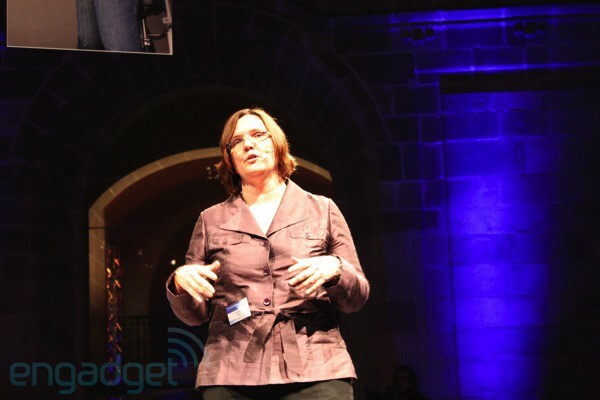 6:45PM Jo: "Before I talk about the transition from Symbian to Windows Phone, I want to talk a little about the strategy that we've chosen." 6:45PM Here comes Jo Harlow! 6:45PM "Nokia has placed a very important strategic bet on Microsoft, and Microsoft has placed a very important strategic bet on Nokia. And that is why we will succeed together." 6:44PM "When you look at all of the value that we're contributing, the value transferred to Nokia is measured in the Bs, not the Ms." That's billions, not millions, folks. 6:43PM "But there's one more that's worth noting. For all of the unique elements that Nokia's contributing, Microsoft is contributing to Nokia substantial monetary value towards Nokia because we're contributing all of these things." 6:42PM "The question is, what's the contribution from Microsoft. They, too are contributing services like Bing and Xbox. They also -- this is a very important thing to recognize in the balance of the transaction -- they are contributing a dependency. They are placing a very significant bet on Nokia for the delivery of the location-based services. But there's another element that comes out of this: we are also receiving a new source of revenue through advertising." 6:41PM "But there's also something else that we're contributing: we're contributing the swing factor. We're contributing the fact that we're making Windows Phone a challenger." 6:41PM "We are also contributing to this partnership the specific technical and hardware differentiating capabilities that will ensure that Nokia Windows Phone products are great products." 6:40PM "We are contributing a variety of services to Windows Phone that will be available to OEMs including Nokia." 6:40PM "The Microsoft-Nokia partnership around Windows Phone goes far deeper than that." 6:39PM "We pay Microsoft royalties for the use of their software. And, of course, the balance to that transaction is that we are able to reduce our operating expenses. We pay them, but we are not also internally developing the software ourselves." 6:38PM "We obviously made the decision to go Windows Phone. We made the decision for a whole variety of reasons, but to understand it more, you need to understand how Microsoft viewed this opportunity to make sure there were more than two ecosystems." 6:37PM "A decision to go with Windows Phone creates a very different dynamic [as opposed to Android]. Windows Phone is a challenger. It becomes a three-horse race." 6:35PM "Clearly, we were assessing three different paths forward. First, there was the largely internal option. The second option -- clearly -- was to make a decision to pursue Android and make a significant bet on the Android ecosystem. Our third option was to join Microsoft and build an ecosystem around Windows Phone." 6:34PM "We're going to cover five broad topics here. 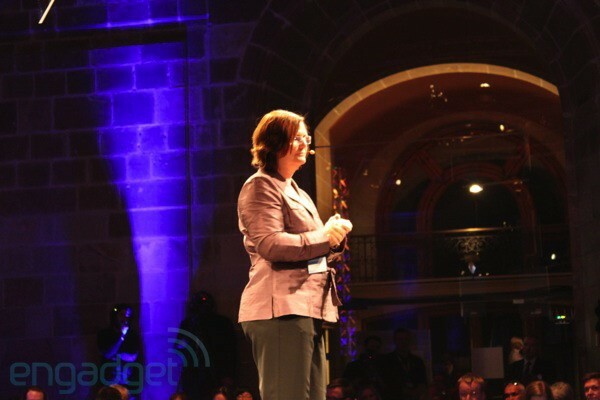 First, I'll talk a little about the dynamics and the nature of the relationship between Microsoft and Nokia." 6:34PM Elop's on stage! He says Jo Harlow will be joining him on stage to clarify some things and answer questions. 6:29PM We're seeing some empty seats in a corner, but this looks like a mostly full house. Lots of interest in hearing Elop clarify what's going on here, we're sure.